Our Forces for London Programme provides ex forces jobs in London as well as career advice to those who face the unique challenges of finding jobs in our capital. The Programme is in partnership with the Mayor of London and is part funded by the European Social Fund. Forces for London provides ex forces jobs and career advice to ex servicemen and women who live in London. It provides access to employers who value the skills and attributes of ex military and support continues through the recruitment process and into the first months of employment. The programme helps Ex Forces find jobs in London across the 32 London Boroughs and the City of London. It provides support for all who are leaving the military, Early Service Leavers and Veterans including Ex Army, Ex Navy and Ex RAF. We provide one-to-one advice and guidance with a dedicated advisor, and can arrange volunteering, mentoring and work experience with employers in the capital. We also organise training to help you get the right skills. Read our Forces for London leaflet. 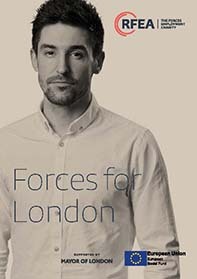 Forces for London is funded by the Mayor of London and the European Social Fund.